(Rick Bowmer | The Associated Press) Gonzaga forward Brandon Clarke, left, guards BYU forward Luke Worthington (41) during the first half of an NCAA college basketball game Thursday, Jan. 31, 2019, in Provo, Utah. Provo • It came against three of the most offensively challenged teams in the West Coast Conference, but BYU basketball coach Dave Rose and his staff aren’t giving it back. The Cougars, not known for their defense in the coach’s 14-year tenure, have held three-straight opponents to 60 points or fewer, the first time they’ve done that since February 2011. “For us, that’s a pretty good formula to win,” Rose said Saturday night after a 69-59 win over Pacific that gave the Cougars (8-3, 16-10) sole possession of second place in the WCC standings, a game and a half over San Francisco and Saint Mary’s, which are tied for third with 6-4 league marks. Kendall Small hit a jumper in the paint with 7:06 remaining to five Pacific a 57-56 lead, but the Tigers (3-8, 13-13) were held without a field goal the rest of the way. 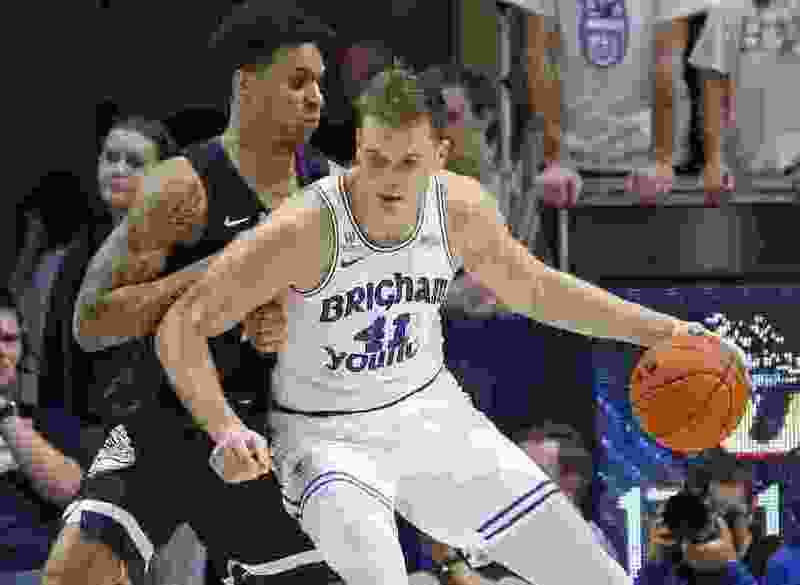 BYU was coming off 83-48 and 67-49 wins over Portland and Loyola Marymount, victories that marked the first time since 2010 that it had held two-straight opponents to fewer than 50 points. A couple starting lineup changes have seemingly triggered the defensive renewal. Rose gave 6-foot-9 freshman Gavin Baxter his first start in the LMU game, and replaced freshman Connor Harding with junior Nick Emery in the starting lineup for the Portland game. Baxter blocked two shots and Emery came up with two key steals against Pacific, but the moves also have energized the other guys. For instance, TJ Haws forced a couple of turnovers in the final five minutes even though he was struggling to score. The coach said he challenged his players with around five minutes remaining to make some plays on the defensive end, and not just wait for Pacific’s guys to miss shots, and they delivered. • Confidence remains a big thing for this group, which plays far better when it has a lead. The Cougars are 14-1 when leading at the half. • BYU will probably never be a great 3-point shooting team this season, but when the long shots do fall life becomes much easier. The Cougars made 19 in the two games. • The Cougars have been OK without former starting point guard Jahshire Hardnett, but will need his contributions down the stretch. Rose said Hardnett, who missed the Pacific game, will have an MRI on his bruised left hand Monday. “He is in probably as much, if not more, pain than when he injured it four or five weeks ago,” Rose said. Yoeli Childs. This unofficial honor might have to be renamed after the Cougars’ 6-8 junior forward, who again carried the Cougars offensively. He had 36 points and 24 rebounds in the two wins and put himself in position to win WCC Player of the Week honors. Luke Worthington’s contributions in the final minutes against Pacific. Some fans were wondering why the senior center was in the game at crunch time, rather than Baxter, until Worthington delivered a steal with 5:25 remaining, a layup with 5:06 remaining and a rebound basket with 3:33 left that gave the Cougars a 65-57 lead and some breathing room. BYU’s newfound defensive prowess will be put to the test this week, as it heads back out on the road to face San Diego on Thursday (8 p.m. MST) at Jenny Craig Pavilion and LMU on Saturday (2 p.m.) in Los Angeles.